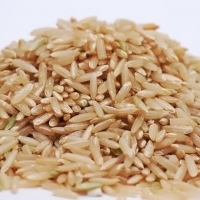 Brown rice should be rinsed prior to cooking. Rinse in cold water and drain well. Cover pot. Put on medium heat till water comes to a slow boil. Turn heat down to lowest possible temperature that allows mixture to simmer. Do not stir as rice may become gummy. Fluff with a fork when removing from pot. Bake, covered, at 350 for 1 ¼ hours or 300 for 3 hours. After rinsing, toast rice in a skillet over medium heat. Stir often until rice is light golden brown. Transfer rice to a 1 quart casserole dish. Boil water. Add water and salt to rice in casserole dish. Stir. Baked covered at 350 for 75 minutes. Yield 3 cups.